1. To undertake and promote forestry research, education and extension, leading to scientific and sustainable management of forests, with special focus on Himalayan forests. 4. To undertake research in silviculture and forest management to develop cost effective natural and artificial regeneration practices, including nursery & plantation techniques. 5. Assessment of conservation status, sustainable harvest and development of appropriate cultivation and postharvest techniques for important non-wood forest products and lesser known tree species. 6. To undertake research on genetic improvement of commercially important sub-tropical and temperate tree species for enhancement of productivity and quality of forests. 7. To undertake biodiversity and ecological assessments for development of site specific conservation strategies, including climate change mitigation and adaptation issues with particular reference to the mountain ecosystems. 8. To undertake research for eco-restoration of cold desert areas, management of pasture lands and rehabilitation of degraded areas. 9. To undertake research and knowledge management on various aspects of forests, viz., forest soils, invasive species, forest fires, insect pests and diseases. 10. To develop, upscale, disseminate and share the appropriate technologies to end-users through innovative extension strategies and capacity building programmes. 1- To carry out and further substantiate research on the natural and artificial regeneration of conifers and their broadleaved associates. 2- To standardize the cost effective nursery techniques of various coniferous species and their broadleaved associates to produce quality planting stock for rehabilitation of degraded areas. 3- To identify quality seed sources and planting material of various species and establish seed orchards. 4- To study the ecological aspects of stress sites including cold deserts and work out models for eco-rehabilitation. 6- To study various diseases and insect pests incidences of important tree species and work out their control measures. 8- To develop suitable agro-forestry models for various zones in the western Himalayan region. 9- Conservation awareness and dissemination of research findings to various target groups. Himalayan Forest Research Institute (HFRI), Shimla caters to the forestry research needs in the Western Himalayan States comprising of Himachal Pradesh and Jammu & Kashmir, those are located in between 30.22' 40" to 37.05' North latitude and 73.26' to 80.30' East longitude. The elevational variations in areas of its jurisdictions varies between less than 300 m above msl along Punjab plains to more than 8,000 m above msl in the inner Himalayan zone in Ladakh. The vegetation is, however, present only upto permanent snowline at an altitude of about 4,500 m above msl. Recordings of stray occurrence of plants at altitudes higher than the permanent snow line are also available at some locations. Total geographical area of the region is 2,77,908 km2 (H.P. : 55,673 km2 and J&K: 2,22,235 km2). 1- Thirty natural populations of Abies spectabilis identified all across the state of Himachal Pradesh for developing a holistic approach towards conservation of this important Himalayan Conifer. 2- Identified 12 populations of Pinus gerardiana by using Isozyme techniques and this outcome will be utilized for developing conservation strategies of this important species. 3- Based upon the morpho-metric traits, Distinctness, Uniformity and Stability (DUS) guidelines for Pinus roxburghii and Cedrus deodara formulated, which were later published by PPV&FRA, New Delhi. This will form a basis for subsequent development of clones for these species. 4- For the mass multiplication of Kaphal stock from seed after giving one week soaking in water followed by one week drying, again repeating the weekly treatment and subsequently sowing in sand beds in polyhouse during June-July breaked dormancy giving >70% germination. 5- Ongoing studies on the planting performance of Diploknema butyracea (Cheura) under mid-hill field conditions of Himachal Pradesh recently showed an attack of Hystrix indica (Indian Porcupine). The severe damage, which has been noticed for the first time in Cheura – may be due to the change in feeding behavior of the animal. 6- 185 species of moths (Lepidoptera) species were identified from various localities in the Cold Deserts of Lahaul & Spiti and conifer forests of Himachal Pradesh. 7- Butterfly diversity was studied in Sub-alpine forests and a total of 75 species of butterflies were identified and GIS mapping was completed. 8- A larval parasitoid, Apanteles ruficrus Hal. (Hymenoptera: Braconidae) was recorded from Thysanoplusia orichalcea (Fab. )- a defoliator of Kuth. Being one of the important biological control agent, the same can be exploited further for the pest management. Extent of parasitism was recorded at 18 per cent in May, 2016 in the Lahaul Valley (Himachal Pradesh). 9- Identified Superior Genetic Stock of P. kurroa and V. jatamansi from different geographical locations of Himachal Pradesh and Uttarakhand. Out of total 34 sources in case of P. kurroa, studied throughout in these states and about 10 sources have been found to contain more than 10% total Picroside. 10- Inventorization and mapping of Ashtwarga group of plants in the state of Himachal Pradesh accomplished. 11- Ethno-botanical information from five villages viz Jubbar, Marog, Matal, Kujvi and Pujarli in Chopal and Bamta Forest Ranges of Chopal Forest Division has been collected through semi-structured interview. In all, 50 people from these five villages were interviewed and ethno-medicinal information on 35 plants prevailing in the area got documented. 13- Total above-ground and soil carbon stock assessed in coniferous and broad leaved forest in district Shimla. 14- Intensive floristic survey in Protected Area Network (Shikari Devi, Mandi & Shimla Water Catchment Sanctuary, Shimla) conducted to generate scientific baseline data for management and developing conservation strategies in these areas. 15- Analysis of the data collected from Shimla Water Catchment Sanctuary revealed the presence of total 460 plant/ tree species. Maximum number of trees belonged to the families Pinaceae and Fagaceae whereas maximum number of shrub species were reported from the families Leguminosae (Fabaceae) and Rosaceae. The herb specie were from the family Asteraceae. Maximum number of threatened species were found in the altitude varying between 1850 m to 2300 m. 10 species were recorded as the critically endangered. 17- Project activities under NRAA in four districts (Baramula, Kupwara, Anantnag and Doda) of the state of Jammu & Kashmir as allotted to the institute accomplished and data uploaded in the portal. The preliminary inferences drawn, show that the socio-economic status in each of the districts varies and similarly, the distribution of vegetation in the forest showed changes. 18- During the studies on fire ecology in chirpine forests, it was seen that in majority of the areas surveyed, pine forests showed the tendency to recover to a greater extent from the fire incidences occurred in the recent past. Altitudinal variations within the range of distribution of chirpine, also showed the similar trends as far as recovery of species is concerned. 20- Published extension material on high altitudinal medicinal plants in vernacular language for the benefit of various stakeholders. 1- A batch comprising of 21 Forest Guards trainees from Forest Training School, Chail alongwith two faculty members visited the institute on 18.05.2012 and the batch was apprised of the achievements and ongoing research activities of the institute. 2- Under Post Graduate students of Forestry & Botany from different universities like Orissa University of Agriculture & Technology, Bhuvaneswar (17th September 2012) and SSV (PG) College, Hapur, Uttar Pradesh (29th October 2012) including Forest staffs of Chhatisgarh State Forest Department (10th July 2012) and trainees of Forest Training School, Chail (19th November 2012) visited the institute. Various forestry issues and problems in forest nursery were also discussed during their visit. 3- To inculcate the sense of belongingness amongst the school children, tree plantation drive by involving the school children was undertaken by the institute at Western Himalayan Temperate Arboretum (WHTA), Summer Hill, Shimla. 4- Eighteen Officers of Himachal Pradesh Administrative Services (HAS) and Allied Services from HP Institute of Public Administration (HIPA), Fairlawns, Shimla alongwith with Mr. Devendra Gupta, HAS, Joint Director of the institute, visited the institute on 10.10.2012 as part of their ongoing training at the institute. 5- Scientists and R.O's of ICFRE undergoing Induction training at Dehradun visited the institute on 16th April 2013. Various forestry issues were also discussed during their visit. The visiting Scientist/RO's were also taken to the various labs of the institute, where, they interacted with the staffs about the various research activities of the institute. 6- To know and discuss about the mandate and ongoing research activities of the institute alongwith other related issues, a team of probationers of Indian Administrative Services (IAS) of Himachal Pradesh Cadre visited the institute on 10th July, 2013. This visit of IAS Officers to the institute was organized by the Director, Himachal Pradesh Institute of Public Administration (HIPA), Mashobra, Shimla. 7- Ms. Purva Sagar Kshirsagar a 5th year B.Arch. student LS Raheja School of Architecture, Bandra Mumbai visited HFRI, Shimla for conducting a research to understand the various aspect of designing, services and functioning of this institute. 8- About 35 Professors and College Lecturers, undergoing three weeks long Refresher Course at UGC – Academic Staff College, Himachal Pradesh University, Shimla, visited the institute on 17th September, 2013. 9- A 12 member delegation of Senior Officers of the Royal Govt. of Bhutan visited Himalayan Forest Research Institute (HFRI), Shimla and had detailed discussions on various research issues of common interests with the officers and scientists of the institute on 6th December, 2013. An institutional presentation on the salient features encompassing the thrust areas, achievements made was made. This visit was coordinated by Inter-national Centre for Integrated Mountain Development (ICIMOD), Nepal. The delegation was lead by Dr. Uma Pratap from ICIMOD. The team in general showed keen interest in the institutional agenda and it was underlined that Bhutan has many research issues in common with HFRI, Shimla. 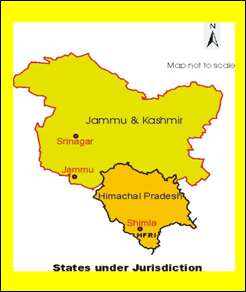 10- Himachal Pradesh State Forest Department through the Govt. of Himachal Pradesh proposed a project proposal on Climate Change to KFW and in order to find linkage of research activities in their proposed programme a team of experts comprising of Mr. Mortiz Reme, Project Manager, Natural Resource and Climate Asia and Ms. Sangeeta Agarwal, Sector Specialists – Natural Resource Management on behalf of KFW, Germany visited the institute on 3rd April 2014. 11- Fifty under-graduate and post graduate students from BabeKe Ayurvedic Medical College and Hospital, Moga Panjab visited HFRI Field Research Station Brundhar, Jagatsukh near Manali, district Kullu (HP) on 30th April, 2014. 12- A 14 member delegation of Senior Officers from the Department of Plant Resources (DPR), Ministry of Forests & Soil Conservation, Government of Nepal visited HFRI Shimla on June 5th 2014. Sh. Jagdish Singh, Scientist-E coordinated the event. In the concluding session, Dr. V.P. Tewari, Director was also present. The delegation expressed the desire to take initiative for preparation of collaborative research projects in the field of medicinal and aromatic plants for the socio-economic development of rural communities and conservation of these bio-resources in different agro-climatic zones of both the countries. 13- Indian Forests Services (IFS) Probationers from Indira Gandhi National Forest Academy (IGNFA), Dehradun visited Western Himalayan Temperate Arboretum (WHTA), Potter’s Hill, Shimla established by HFRI in collaboration with SFD, HP on 15th and 30th June 2014. 14- A team comprising of Dr. Ranjeet Singh, Scientist-F, Forest Protection Division and Dr. Ranjeet Kumar, Scientist-D, Ecology & Biodiversity Conservation Division visited Habban Forest Range of Rajgarh Forest Division from 1st to 3rd August, 2014 to investigate the epidemic in Deodar forests. 15- Dr. Sandeep Sharma, Scientist-F and Sh. Jagdish Singh, Scientist-E, attended ‘Aroma Festival’ at Bhaderwah (J&K) on 5th August, 2014 organized by Indian Institute of Integrative Medicine (IIIM), Jammu and made presentations on ‘‘Selected High Altitude Medicinal Plants: Nursery and Cultivation Techniques’’ and “Intercropping of High Valued Temperate Medicinal Plants with Horticultural Plantations: An Option for Diversification and Income Generation” respectively. 16- A team comprising of 20 officers and staff members from NMPB, New Delhi, headed by Dr. Sanjiv Kumar, Assistant Director (Ay.) and Sh. Akif Iqbal Alvi, Marketting Assistant, visited Field Research Station at Brundhar, Manali (H.P.) on 16th August, 2014. 17- Faculty and students of Forest College and Research Institute of Tamilnadu Agriculture University, Mettupalayam visited the institute on 27th August, 2014. The visit was coordinated by the Agroforestry & Extension Division of the institute. 18- Faculty and a group of 63 B.Sc. Forestry (Honours) 3rd Year Students from Dr. YS Parmar University of Horticulture and Forestry, College of Forestry, Nauni, Solan (HP) visited HFRI, Shimla on 15th November, 2014 and were apprised of institute’s mandate and the ongoing research and extension activities. 19- Sh. NPS Dhaulta, Assistant Conservator of Forests and 15 participants representing elected members of PRI, progressive farmers, VFMs visited HFRI on 28th November, 2014 to oversee the activities being carried out by HFRI especially in the field of biodiversity. Sh. PS Negi, Scientist coordinated the event and Dr. RK verma, Head, E&BC also apprised about the works carried out/ being taken up by the institute in the field of biodiversity conservation. i- 40 Nos. of B.Sc. Forestry Final Year Students alongwith faculty members from Central Agricultural University, College of Horticulture and Forestry, Pasighat (Arunachal Pradesh) on 1st January, 2015.
ii- 20 Nos. of B.Sc. third year student alongwith two staff members from Dr. Balasaheb Sawant Konkan Krishi Vidyapeeth, College of Forestry, Dapoli, Distt. Ratnagiri, Maharashtra, on 14th January, 2015.
iii- 45 Nos. of B.Sc. (Forestry) student alongwith 03 course teachers from Sam Higginbottom Institute of Agriculture, Technology & Sciences, formerly Allahabd Agricultural Institute, Allahabad, on 2nd February, 2015.
iv- 2nd visit of 22 Senior Level Officers and Project Coordinators from Ministry of Federal affairs and local development Govt. of Nepal was also coordinated by the institute on 28th February, 2015. 21- 93 students of M.Sc.-I Semester (Environment Science) and M.Sc.-I Semester (Botany) alongwith 07 faculty members from Deptt. of Botany, Environmental Science, University of Allahabad, Allahabad visited HFRI on 21st & 22nd September, 2015 on educational tour to Himachal Pradesh. On 21st September, 2015, Dr. Vaneet Jishtu, Scientist-C of this institute escorted the group from Shimla to Narkanda and apprised them about the various varieties of medicinal plants naturally grown in the adjoining forests. 22- 25 Nos. of student of B.Sc.-I & V Semester (Forestry) alongwith 03 faculty members from Baba Farid Institute of Technology, Dehradun visited this institute on 19th October, 2015 in connection with their compulsory educational tour to Himachal Pradesh. During the visit, the students were apprised of the institutional mandate and the ongoing research and extension activities through a power point presentation. 24- Prof. Klaus v. Gadow, Institute of Forest Inventory and Remote Sensing, University of Goettingen, Germany visited HFRI, Shimla during April, 2015. He conducted an in-house workshop on the ‘Use of Statistical Software ‘R’ in forestry’. He delivered two lectures on ‘Scientific writing and publishing’ and on ‘Analyzing Forest structure and diversity’. He also helped HFRI scientists in data analysis & interpretation, and also gave field demonstration in plot layout and measurement techniques. He also visited ICFRE, Dehradun, had discussion with DG, ICFRE and delivered a talk on ‘Forest observational studies: an essential data source for use of complex ecosystem’ to the students of FRI University on 23rd April 2015. 25- A five member USAID team consisting of Mr. Todd Johnson, USAID/Washington, Ms. Juliann Aukema, USAID/Washington, Mr. Mark Newton, USAID/India, Mr. Varghese Paul, USAID/India and Mr. Soumitri Das, USAID/India visited HFRI on 19th September, 2016 and had an interactive meeting with the Director and Officers/Scientists regarding designing of a new project, in collaboration with the HFRI, that will follow USAID's and MOEFCC's Forest-PLUS project. 26- The institute organized a Kisan Mela on 20.02.2017 at Panthaghati, Shimla, (H.P.). About 50 farmers of Shimla and Sirmour districts participated in this Kisan Mela. Sh. S.S. Negi, IFS, Principal Chief Conservator and Head of Forest Force, Himachal Pradesh inaugurated the Kisan Mela as the Chief Guest. Dr. V.P. Tewari, Director, HFRI, Shimla While welcoming the Chief Guest and other guests, the august gathering about the history of HFRI, achievements, present activities and the future plans of the Institute. During the Kisan Mela, scientists from various organizations were invited who delivered the talk on various themes and interacted with the farmers. 27- The institute has three Van Vigyan Kendras-one at Brundhar, district Kullu (Himachal Pradesh) and two in Jammu & Kashmir (Janipur, Jammu and Leh in Laddakh region). During the year, two training programmes one each at VVK, Brundhar (Agroforestry for Sustainable Development and VVK Janipur (Nursery Techniques and Cultivation of Medicinal Plants) were organised for dissemination of technologies developed by the institute. The research findings of the project published in Hindi for understanding of the stakeholders (farmers, field functionaries) has been placed in respective VVKs for dissemination of the information. One Model village at Lanabaka district Sirmour is also run by the institute. 1- Mr. G.R. Sahibi, IFS research scholar, registered with FRI (Deemed) University, Dehradun, under the supervision of Dr. KS Kapoor, Scientist-G and Group Coordinator Research for his Ph.D. Degree through this centre was declared eligible by the Research Degree Committee of the university for the award of the Degree of the Doctor of Philosophy (Forest Ecology and Environment). 2- Mr. Sanjay Sood, IFS research scholar, registered with FRI (Deemed) University, Dehradun, under the supervision of Dr. KS Kapoor, Scientist-G and Group Coordinator Research for his Ph.D. Degree through this centre was recommended and declared eligible by the Research Degree Committee of the university for the award of the Degree in the field of forestry (Forest Ecology and Environment). 1- Department related Parliamentary Standing Committee on Science & Technology, Environment & Forests visited Shimla from 14th to 16th October, 2015. The main objective of the Committee to visit Shimla was to hear the views of various stakeholders including Experts, Non-Governmental Organizations/ Civil Society Organizations on ‘The Compensations Afforestation Fund Bill, 2015’ and Environmental Issues of Himachal Pradesh in general and Shimla in particular. As per programme, the Committee heard the views of the Non-Governmental Organizations/ Civil Society Organizations on 14th October 2015 and also heard the views of Officers of Government of Himachal Pradesh on 15th October 2015 on the above said Bill. In the afternoon of 15th October 2015, the Committee visited Himalayan Forest Research Institute, Panthaghati, Shimla. Dr. V.P. Tewari, Director, HFRI, alongwith scientists and staff of the institute, welcomed the Committee members in Himachali Tradition. 2- Similarly, during the year 2016, Department-related Parliament Standing Committee on Science & Technology, Environment & Forests also visited the state of Himachal Pradesh on 10th & 11th June 2016. The objective behind this visit of the Parliamentary Committee was to discuss the recent forest fires and its effect on environment, forest, biodiversity and wildlife and remedial/ preventive measures with the representatives of NOGs/ Civil Society Organizations, Government of Himachal Pradesh, Himalayan Forest Research Institute (HFRI), G.B. Pant Institute of Himalayan Environment & Development, Forest Survey of India (NZ), Geological Survey of India, Ministry of Mines, National Disaster Management Authority, Ministry of Home Affairs and Union Ministry of Environment, Forest & Climate Change and Himachal Pradesh Forest Department. 3- Ministry of Environment, Forests and Climate Change, Government of India had earlier decided to carry out the Academic Audit of different institutions under the Ministry including ICFRE and its regional Institutes. The Audit team consisting of Dr. Ram Prasad, IFS (Retired) and Professor MSM Rawat visited HFRI, Shimla from 16th to 18th June 2016 for carrying out the academic audit of the Institute. 4- A team of Japan International Cooperation Agency (JICA) comprising of Mr. Kato Takaaki, Country Officer, South Asia Division-I and Mr. Kawashima Yutaka, Executive Technical Adviser to the Director General, Global Environment Department visited HFRI, Shimla on 23rd February, 2017 to discuss and to seek scientific inputs on the project titled “Forest Ecosystem Management and Livelihood Issues”, which has been submitted by the H.P. State Forest Department to JICA. 5- As a part of India Exposure and Experience Sharing Visit, a 15 member high level delegation headed by His Excellency Dr. Gemedo Dalle, Minister of Environment, Forests & Climate Change and His Excellency Kebede Yimam, State Minister, Environment, Forests & Climate Change, Government of Ethiopia visited Himalayan Forest Research Institute, Shimla on 17th March 2017. After the formal welcome of Ethiopian delegation, Director In-charge HFRI, Shimla apprised them about the various research activities accomplished/ being carried out and the achievements of the Institute. Later, his Excellency Dr. Daale addressed the scientists and officers of the Institute. Hon’ble Minister, Dr. Dalle informed that the Government of Ethiopia is giving due attention to forestry research and in view of this, the delegation is visiting India to learn about the progress made by the country in the field of forestry research so that his country ‘Ethiopia’ can benefit from the experiences of India.